These little guys are actually the unrefined seeds from the cocoa bean, which means they’ve been less processed than cocoa powder or chocolate liquor. 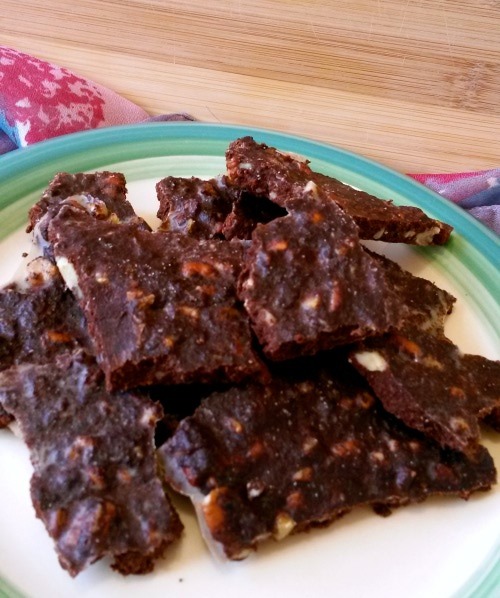 Since the goal of a whole foods diet is to try to eat everything as close to nature intended, cacao nibs are great addition to snacks, meals, and treats. I find they add a great textural element to desserts, but because they aren’t very sweet they can be used in savoury preparations as well. The nibs are a great source or antioxidants called flavonoids, which help boost our health by altering cell-signaling pathways. Try adding them to smoothies, granola, or nut mixes for an extra punch of nutrition! This Peruvian root veggie makes it into my diet daily. As someone who has been dealing with hormonal imbalance issues for quite some time (check out part of my journey here), maca is a great medicinal food to incorporate into my treats. Thanks to its nourishing effect on the endocrine system, maca helps rebalance hormones throughout the body in men and women. Plus it adds a lovely, toasted caramelly flavour to beverages or sweets. This ingredient is comprised of the fatty bits of the cocoa pod and it contains lots of healthy saturated fats, such as stearic and palmitic acids, to help nourish our skin, brain, and body while providing us with a clean and healthy source of energy. This beautifully scented fat is also high in a compound called cocoa mass polyphenol (CMP), which, from what I’ve gleaned from various studies and articles, is an antioxidant that is protective against the formation of various cancer cells and can help prevent CVD. This action is likely linked to its regulating effect on T-cells (an important part of your immune system) and can help lessen symptoms of immune-modulated body imbalances such as fibromyalgia, psoriasis, and chronic fatigue syndrome. Roughly chop pecans and walnuts. Add pecans, walnuts, and ~ 1/2 tsp. sea salt to frying pan and toast until fragrant, stirring occasionally. About 3-5 minutes. Remove nuts from frying pan and set aside. While water heats up, cut cocoa butter into small chunks to help it melt faster. Add cocoa butter, butter, and vanilla to the double boiler, stirring until melted and combined. Once melted whisk in cocoa powder until smooth. Add maca and Ashwagandha, whisking in until combined. Stir in pecans, walnuts, and cocoa nibs. (This is where you would add the gojis and/or coconut as well). Spread in a thin layer over parchment paper, sprinkle with sea salt (and hemp hearts if desired), and place in the fridge or freezer to set. Alrightyroo, that’s all for today folks! It’s a beautiful day outside and I want to go soak in some sunshine before yoga this evening. Have a wonderfully whimsical weekend!